Over the holiday break, I finished a few large projects, some of which has taken weeks and months, some were rushed to get under the Christmas tree. Then there were the everlasting works in progress – mindless, relaxing projects that just hang out, where you can watch a movie and work on a few rows at a time. After all that, I really wanted to just complete something quick, while the excitement of a new project is still lingering, so I called it my palette cleanser project, and it just so happens that it’s perfect for Valentine’s Day. 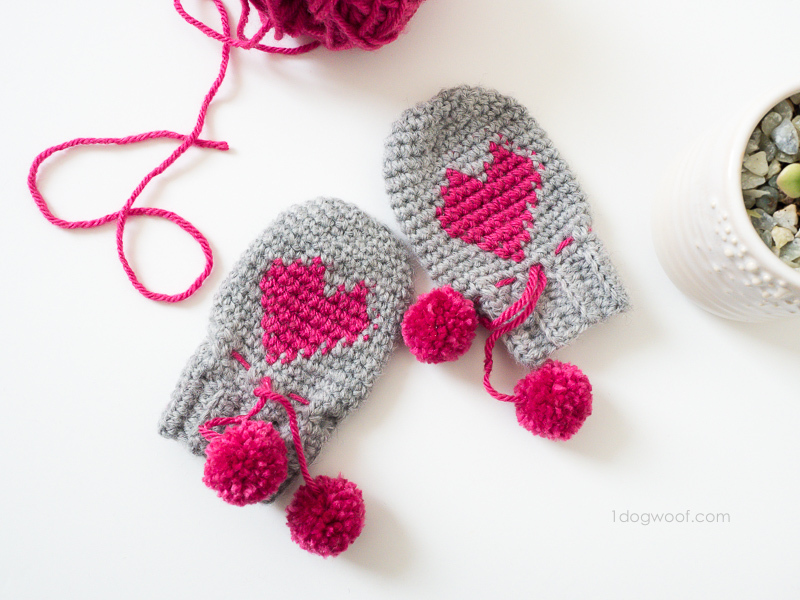 Here’s the pattern for my Baby Heart Mittens (no clever name here…)! Every two weeks, we have a housekeeper come in to clean the house. Of course, that means I’m scrambling to clean the house the night before. In one of my recent scrambles, I found a baby mitten that had been gifted to my daughter. Since it was meant for an infant, there were no thumb holes, and I thought that might be a fun project to work up. After a bit of thought, I figured the construction would be similar to a hat, just smaller and more elongated, which means it’d be perfect for a chart. Yup, I’m a sucker for drawing graphs! Since the mitten is so small, sized for a 1 year old or younger, I knew I needed yarn that was thinner than my usual worsted weight. I also knew that using thin yarn means the color changes in the chart would be more visible. So, I ended up using Lion Brand Wool Ease for the main color, and Lion Brand Vanna’s Choice for the secondary color, which is used for the heart. The Wool Ease and Vanna’s Choice are both considered Level 4 worsted weight, but I found the Wool Ease to be slightly thinner than the Vanna’s Choice. 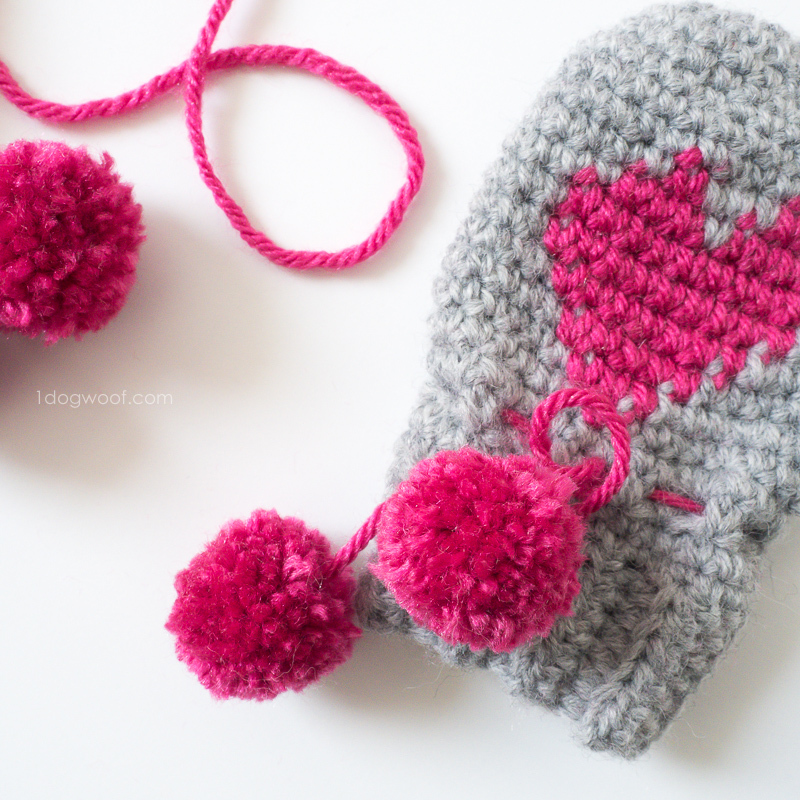 This meant the mitten can be a bit more delicate, but using the Vanna’s Choice for the heart meant the slightly thicker yarn can hide the color changes better. Win win win. Using the Wool Ease as the base also means these mittens are warm and soft, perfect for warm, soft baby fists. 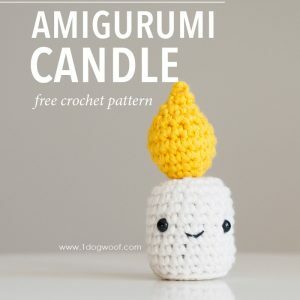 This pattern comes in one size only, and uses basic crochet stitches, other than the foundation half double crochet, video below. I made these tiny pom poms using a fork in place of my two forefingers shown in the picture below. The only tricky part about the whole thing, believe it or not, is adding the pom pom ties at the end. 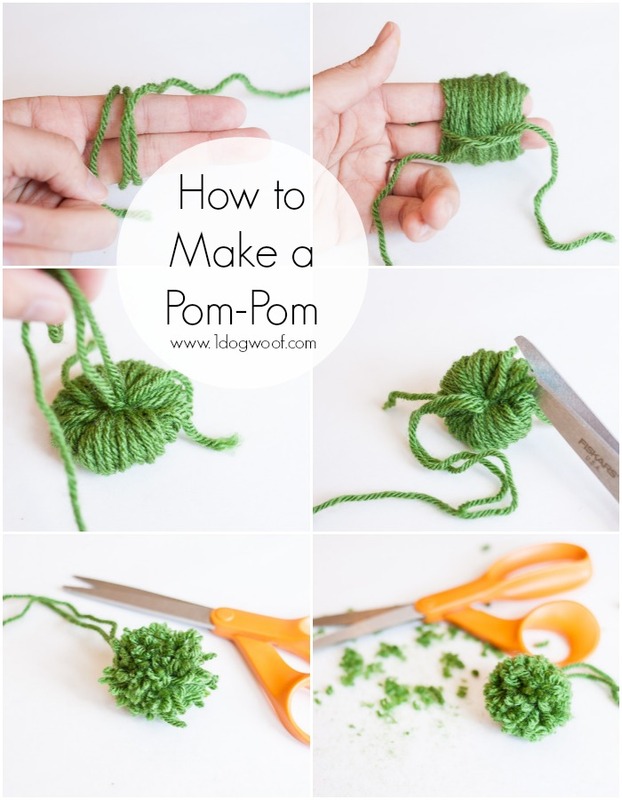 Since the pom poms don’t fit through the mitten itself, you have to make two pom poms, thread them in and tie them together. That doesn’t sound hard, but I made it hard when I tried to use my invisible knot. I think it’ll be easier to just tie a square knot in the back of the mitten. Alright. Quick project, less talk. Here’s the pattern! Ribbing is worked flat and then seamed. Rounds are worked seamlessly in a spiral. Use a stitch marker to keep track of each round. Start with size F hook. 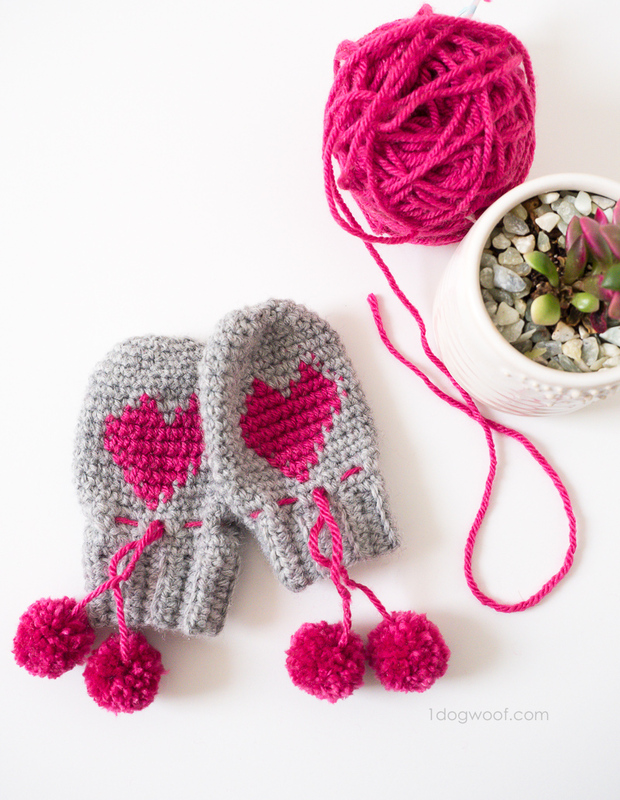 I hope you know a little one in your life who could use these warm little baby heart mittens! I don’t have a baby at home anymore, and all my friends’ babies are boys, so I’m not sure why I made this in pink, but I love pink! Even in another color, this would make a great gift for Valentine’s Day to the little one that has captured your heart. 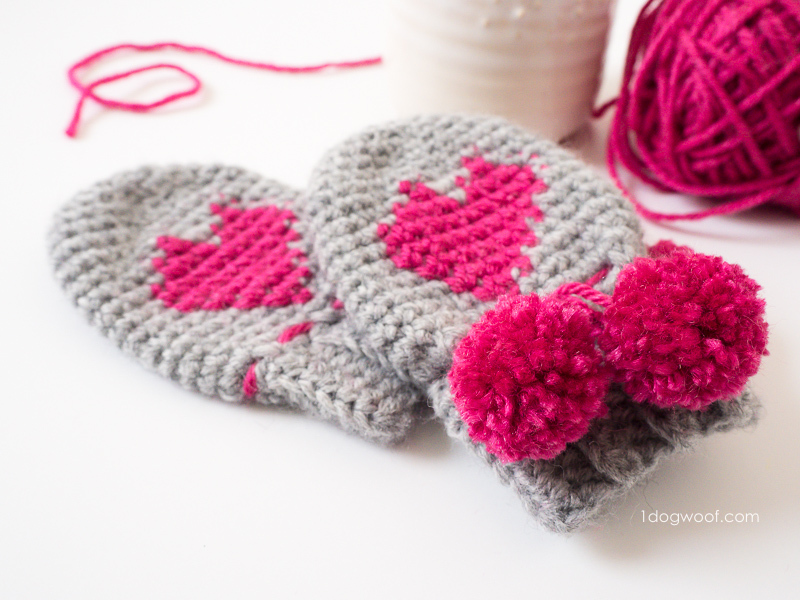 Share your finished heart mittens with me on Facebook (One Dog Woof) or Instagram (@1dogwoof)! Remember to tag your post with #1dogwoof!